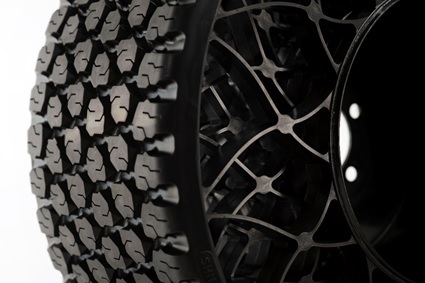 The Goodyear Tire & Rubber Company has released a non-pneumatic, or airless, turf tire as a solution for users who desire worry-free performance. The tire is available as an upgrade option on Bad Boy Mowers’ Outlaw XP, a zero-turn radius model, with expected availability in early 2018. The technology is part of the company’s strategy to develop maintenance-free technologies for passenger and commercial vehicles, particularly in fleet applications. 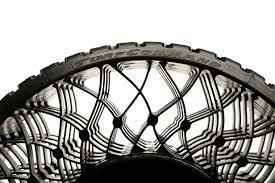 Goodyear has been developing non-pneumatic technologies since the 1970s when it participated in the design of tires for NASA’s Apollo lunar roving vehicle, and in recent years in the development of a tire for future missions to Mars. For this new application, the Goodyea r TurfCommand with DuraWeb™ Technology is an optional fitment for the premium Bad Boy Mowers model. Goodyear’s exclusive DuraWeb™ Technology has been in development for the past few years at the company’s Innovation Center in Akron, and is being manufactured in the U.S., exclusively for Bad Boy Mowers. Goodyear engineers and scientists incorporated feedback from field studies that included the Cleveland Metro Parks and with mower dealers, such as Beltz Lawn and Garden Equipment in Akron, Ohio and the team at Bad Boy Mowers to create a product for the benefit of the end-user. Bad Boy Mowers, headquartered in Batesville, Ark., has built its reputation on delivering a better zero-turn mower for a better value, and is celebrating its 15thyear of business. Delivering more innovation, from the patented Swing-Away™ design, E-Z Ride™ and Armor-Tek 5 Deck™ advantages, and coupled with its legendary build strength, every Bad Boy Mower is designed to be easy to operate, easy to maintain and last for years with its ruggedness, power and reliability. Bad Boy Mowers are sold through a nationwide dealer network (www.badboymowers.com).